Working on the periphery of the firearms industry, friends and colleagues assume that I’m their go-­to source for the latest information on industry trends and new products. Sometimes I am, but not always. When my interest evolved into intrigue, I contacted CoolFire’s marketing manager, Ján Sabo, to learn more about the Oklahoma-­based company’s firearms training enhancement product line. According to Sabo, CoolFire trainers are employed in your own handgun, which means you have to order the unit or kit specific to your desired pistol’s make and model. I requested a CoolFire recoil laser kit for a Glock 19 Gen4; upon arrival, installation was as simple as replacing the barrel and recoil spring with the CoolFire barrel and recoil spring. No gunsmithing required. Installation of a CoolFire laser recoil trainer is as simple as replacing the barrel and recoil spring with the CoolFire barrel and recoil spring. CoolFire’s level of realism is accomplished through the CoolFire barrel assembly that contains a reservoir that the user charges with compressed CO2 from either refillable tanks or disposable 90-­gram cartridges. With each trigger pull, your pistol’s striker or firing pin impacts a valve mechanism that releases a dose of CO2 that cycles the slide, resets the trigger and provides realistic recoil. The benefits of the CoolFire training platform are numerous, but the biggest benefit is that you’re using your own pistol. There is no deviation from your familiar fire controls, trigger break and reset, and you get to use your preferred sights and/or optics. The platform dimensions, holster selection and the manual of arms for operation from your operational platform to your training platform does not change. 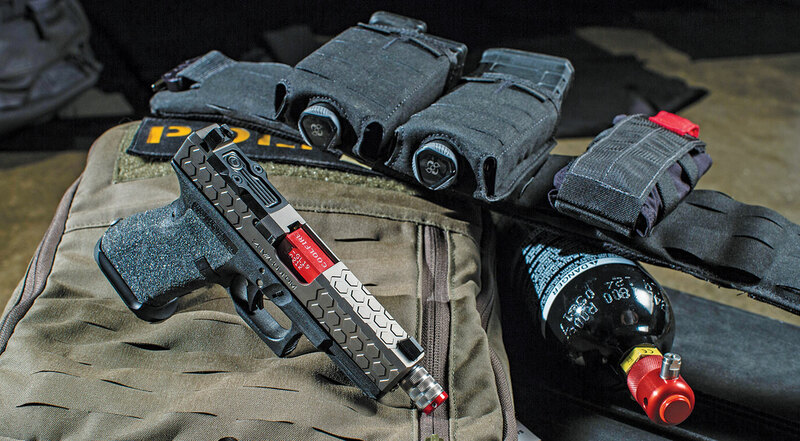 There are some among us who’ll point out that dry-­fire training with a preferred pistol platform is free, and, if so desired, there are laser-­training aids available for integration at a lower price point than the CoolFire system. Both points are valid, but I offer a counterpoint for your consideration: “Train how you fight.” Isn’t that a common mantra? 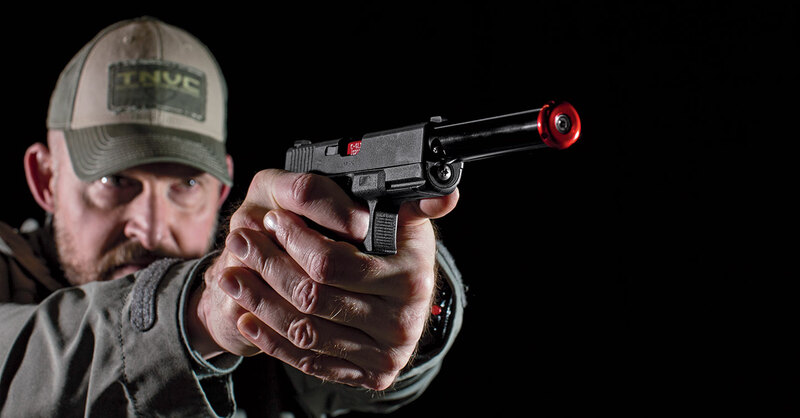 Traditional dry-­fire training on striker-fired pistols require the slide to be manually manipulated after each shot to reset the trigger for subsequent target engagements. Unless Murphy is raining down acute levels of hate and discontent, that’s not how a semiauto pistol is operated. 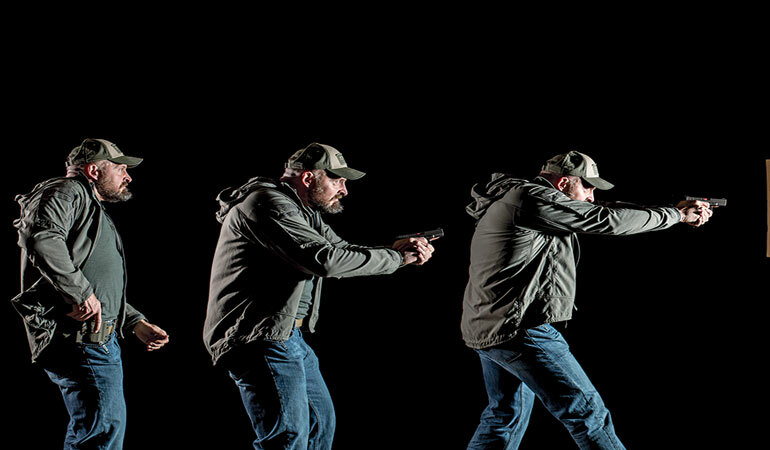 I’ve heard some theorize that repetitive reinforcement of the aforementioned “nonauto” auto-­loading pistol dry-­fire training has the potential to institute training scars, and although I understand the logic, a recommendation to eliminate traditional dry-­fire training is a bridge too far. That said, identifying the superiority of a training platform that more closely mimics the operation of your auto-­loading pistol is irrefutable. The CoolFire trainer introduces a wide degree of flexibility into a shooter’s training regimen. 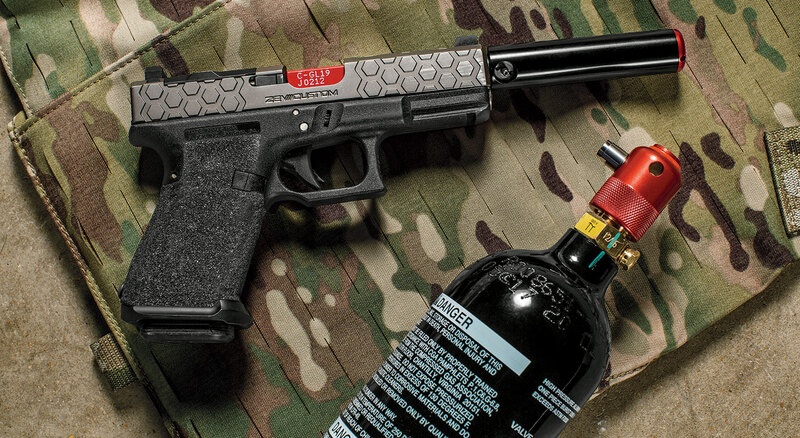 Once the prominent, red CoolFire barrel is installed, the potential to chamber a live round is eliminated, enabling commencement of a hearing-­safe training session appropriate for any off-­range training venue: home, classroom or otherwise. CoolFire kits are shipped with two slide release inserts that make your magazines compatible with the training platform by prohibiting slide lock on empty mags while still permitting the use of training rounds or snap caps to induce malfunctions for a more effectual training experience. A YouTube search of “CoolFire malfunction drills” will produce videos of Sabo demonstrating how to stage and clear a gamut of simulated pistol malfunctions when training with the CoolFire system. The CO2-powered CoolFire trainer is a cost-effective means to enhance the realism of an off-range training regimen. The number of trigger pulls per fully charged CoolFire trainer is somewhat dependent upon the model of the pistol in which the unit is installed. It’s a simple matter of reservoir capacity; a Glock 17 barrel is dimensionally larger (longer) than a Glock 19 barrel, therefore the 17’s larger CO2 reservoir will provide more trigger pulls before recharging. That said, the Glock 19 CoolFire trainers utilized in my evaluation netted up to 20 trigger pulls before recharging. CoolFire offers an optional Extend-­A-­Shot (EAS) canister with integral red laser that increases the number of shots between CO2 recharges to approximately 100. The EAS canister attaches to the CoolFire barrel and resembles a suppressor (albeit a small one), adding approximately 3¾ inches to the length of your pistol when attached. Similar to a suppressor, the EAS canister will impact the integration of a holster into training. If I haven’t hit any points yet to interest you in a hearing-­safe, slide-­cycling, dry-­fire super tool that can be safely used in a plethora of off-­range venues, there’s a card left to play. For the shooter who trains, the CoolFire laser recoil trainer makes financial sense; the capital expense of the initial investment in the CoolFire unit can be quickly recovered in reduced ammunition costs. A 90-­gram CO2 canister will provide approximately 350 to 400 trigger pulls; refillable tanks offer more (depending on the size of the tank). If you do the math, you’ll discover that your training costs will be reduced to fractions of a cent per trigger pull. Let “dry-­fire on steroids” begin!